Designs by Lisa Somerville: ISC Challenge and Blog Candy! ISC Challenge and Blog Candy! If you've stuck with me and my numerous postings today - you're in for a treat! I've got some great ISC Blog Candy to give away! And what better day to be giving away presents than on my DH's Birthday! He said he didn't want anything - so one of my readers will get a gift! Wanna chance to win? Simply leave a comment here on my blog telling me one of your favorite Holiday Traditions or a Holiday Memory....A tradition here at our house is waking Christmas morning opening presents, then have a big breakfast together. Now that my boys are older, it's nice being able to sleep in on Christmas! One of the many traditions growing up, was that my mom would put her "man on the moon" ornament in the same spot on her tree every year! Be sure to leave a comment by Sunday, December 13, 11PM and you'll be entered for a chance to win Innovative Stamps Creations Mini Book Series:Be Thankful. I'll have the Random Number Generator pick a winner and post on Monday. You'll have to check back to see if you've won - as Blogger comments don't always have email address. On to today's ISC Challenge....Make an item featuring fragments as your focal point, if you do not have fragments use acetate, be sure to include ISC images in your project. Then post a link to your creation on the ISC Blog by December 21, for your chance to win Art4Frames II and 1 package of Tim Holtz Fragments of our choice. For my challenge piece I used Spectrum Roll Technique and the Mini Book Series:Be Thankful. I also used the Painted Mesh Technique on my Mustard card stock using Adirondack Snowcap. For my fragment piece - I stamped my sentiment in Black Stazon, then used my Alcohol Inks to do the Polished Stone Technique to the back side, then tied it onto my Artichoke Grosgrain. My most memorable xmas was 3 years ago when I told Alan I would love to haave a fairy tale xmas since all my life I was on the outside looking in. You wouldn't believe what my house looked like. It was truly a fairy tale. Presents came way way out from the tree for the 4 of us (My sister and her hubby too.) I felt like a princess. Wow!!!! One of the fun family traditions actually is on Christmas Eve. We all go to church for the Candle Lite service then come home to cookies and hot cocoa. All the girls then rush to the bedrooms and come out in brand new holiday jammies and the boys get lounger pants and a new t-shirt. We then each get to pick one gift to open. Most of the family has more than one place to go for Christmas day so we started this Christmas eve ritual after church. It has really turned into a fun filled evening. We open our gifts to one another before we eat (everyone brings "finger foods") and then before dessert, we open our stockings - each person puts a dollar gift in each stocking - and of course Christmas music is playing throughout. It's a sight to see all 20 handmade stockings hanging on the mantel! What has become a tradition in my family is my home made icecream plum puddings! Well, it is summer during Christmas in Australia so it's usually too hot for a traditional hot cooked plum pud! 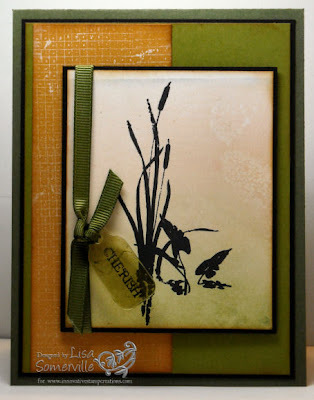 Love the soft pretty background for your stamped image on your card Lisa! We have had many memorable Christmas's but I will be different and tell the saddest one--my grandmother passed away unexpectedly on Christmas eve and my husband and I got the call that she had passed. So we left to drive to mom's town where she was involved in the Christmas eve contata at our church called "Home for Christmas'. We waited outside the church in the frosty air and crystal clear starry sky waiting to tell her the sad news. I could see the candles burning in the church windows and the beautiful music coming from inside. I knew that Nana had gone home for Christmas. I will never forget that night. Your card is so beautiful! I love that image you used! Some of my favorite Christmas memories are from when I was little. My sister and I would re-arrange the presents under the tree in the middle of the night! It was so much fun! Thanks for the chance to win and Happy B-day to your DH! Lisa, you are incredibly talented!! I LOVE that tag! Hey, that's something that even I can do! LOL! As for Christmas traditions, I brought to my family the tradition I grew up with of opening one present on Christmas Eve. Our DS is 5 this year, so as of last year, he isn't allowed to go downstairs until 7am! Yes, we're mean that way! LOL! Pretty card - love the tag! My favourite holiday memory was when the dog ate the sweets that were used to decorate the tree - it took us ages to find out why it was walking about looking guilty. So we were left with the non-edible ornaments only. I secretly thought the tree was actually looking better than it had before - it had been an little over-decorated! Beautiful card! And, great stamp set. One of my Christmas traditions is waking up really early on Christmas morning and waking up everyone else. :) I love Christmas and I am always so excited. I still do this as an adult. My favorite Christmas memories are from when I was a child many moons ago. On Christmas Eve we would go to bed and our house looked like any other day of the year. On Christmas Day we would awaken to a tree fully decorated with presents everywhere and other decorations all throughout the house. It was truly a Christmas Wonderland. Do I believe in Santa? You Betcha! Memories of childhood Christmases are my favorite. This year will be a hard one as it is the first year that both my parents are gone. They will be looking down on us with the other angels. What we do now that the boys are older is my husband and I drive around on Christmas eve and look at all the lights in the area.We also have a prime rib dinner on this night. We sleep in on Christmas morning and then open gifts and have a large late breakfast. I grew up across the street from my grandparents, so after we opened presents we would always have a big family dinner at my grandmas. Thru the years we continued you this tradition and my kids had huge family dinners at my mothers. Now we do the same thing except now I am the grandmother and everyone comes to my house for the big family dinner. Family is extremely important in my life and I am glad to be passing that onto my children and their families! God Bless!! Our favorite holiday tradition is to have a birthday party for Jesus before we head to church on Christmas Eve and now that the kids are adults we open presents when we get home. Happy Birthday to your DH! Thanks for thinking of us for a sweet celebration. Love your card and the colors are beautiful. Each year the family gets together and go cruisin looking at all the beautiful Christmas lights and displays. It's so much fun. Thanks for a chance. Love all of you artwork. I just found you. I am new to technique junkie. your card is very "relaxing" in this time of rush, rush, rush! my husband and i still deliver "santa" gifts to our children on Christmas morning even tho they are grown and married. we'll always continue to make great memories. One of my family's Christmas traditions is the Christmas Eve get together. We eat dinner at my parent's house and we read the Christmas story from the Bible. The little ones open a gift and we eat snacks and drink hot cocoa. We also have the tradition of getting up and opening our gifts and then having breakfast together. I make a breakfast cassrole and it is cooking in the oven while we open our gifts. It works out perfectly!! As usual, one magnificant card. I have several that are especially memorable Christmases, but one that really stands out is the last one I got to spend with my mother. She had been diagnosed with ovarian cancer, but with her oncologist's encouragement, she and Daddy flew from CO to southern IN (with my help) to spend Christmas with us. It meant two round-trip jaunts for me to fly out to get them and fly them home in a week's time, but so very worth it. My favorite tradition is a card my Mom sent me in 1969 in Denver. It was a velvet red card made to look like a package. In reality it was originally sent to her from a friend and she liked it so well , she used it to send to me as a gift tag. She was in Ohio and this was my first year away from my home town. Pregnant with my third child, homesick for my Mom, and the got this beautiful red velvet cardd. So for many years, up until her death 15 years ago, we sent this back and forth to each other with the year on it. Then I started the tradition with my oldest daughter and it continues today. Brings back sweet memories. Gorgeous card as usual Lisa! 2:00 PM for a big dinner and stayed for the rest of the day and evening. Christmas was always at our house. Nice card, great color combinations. Happy Bday to DH, hope he had a wonderful day. My favorite memory of Christmas was when my children were little. They always thought that Santa brought the tree and presents. I never put our tree up until they were in bed Christmas Eve, so when they awoke Chritmas morning they were always sooooooooooo excited to find a decorated tree and presents. Thanks Lisa- love all of your samples. My best Christmas memory was when i lived in Chile ... a few people organized a huge BBQ in the street and all the homeless people or people who just walked along the street could take a seat and join... it was fantastic !! My most memorable Christmas' were when the kids were little and seeing their eyes open wide when they saw "Santa's presents" under the tree. Also, they always wondered how Santa ate all those cookies and milk from everyone's home around the world! LOL!! Lisa - I love all of your cards and visit your site whenever I log in ... how did I miss this?!?!!? Thanks for sharing your techniques and artwork with us! Have a great Holiday. Last Christmas was pretty amazing! Every Christmas I send my 2 grown sons giant stockings full of lots of things they want (or I think they want). My husband and I live in Hawaii and my sons in California. Last year my husband volunteered to mail the packages - very rare for him! A few days before Christmas he went into town - shopping he said. When he got home he asked me to come out and help him unload some groceries. When I opened the door out popped my youngest son! My husband had arranged for my boys to spend Christmas with us. I cried tears of joy - and it turns out my husband never mailed my packages-so the boys gifts were still with us for crinwil2them to open on Christmas morning! Since moving to Oregon four years ago my cats have initiated a new Christmas Eve familiy tradition. Namely waking me up at midnight and then again at 6 am! They love to walk in the snow in the moonlight and Christmas Eve seems to be something special for my little furfaces. I don't know if they've ever seen Santa but I keep thinking about the legend of the animals speaking on Christmas Eve. Either way it is fun to walk in the moonlight with them on such a Holy Eve. Makes up for missing Midnight Mass when the snow is piled too deep to get my truck down my access way. Always a lovely ring around the moon that washes pearly light over all the landscape. God's own version of embossing perhaps? Merry Christmas everyone and thanks for sharing! Hello Lisa, we would begin on Christmas Eve at my parents home with a huge dinner. Then the gift giving would begin between 8 siblings and the grandchildren. My mom and dad would just sit around smiling watching all the paper flying. We would only allow one present to be opened on Christmas Eve. Then we would meet early Christmas morning for church and finish our gift giving and surprise presents to our parents and children. Since our parents have died we are keeping the tradition going with our children. Have a Blessed Christmas. I remember waking as a child and we would gather in the kitchen and drink orange juice till everyone was awake and in the kitchen. Then one at a time each kid(there was three of us) would go down to the basement living room and get our stocking. So you were able to get a little peek of the tree and presents...when stockings were done we went down and we open presents.then we would walk next door to grandparents house where all close family memebrs would gather the rest of the day. I miss all the family this time of year.